Liza Minnelli's act was worthy of a Tony. Photos from ebay Web site. SOMETIMES it’s not that hard to meet the theater lover's strict criteria for the odd or unusual. 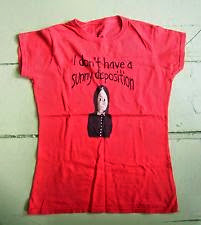 For proof, look no further than – say – ebay. Bid for some of the many items of memorabilia on display. 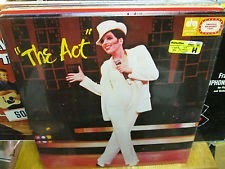 A recent visit yielded a still-sealed album of the Liza Minnelli tuner, “The Act.” Kander and Ebb wrote the musical as a comeback vehicle for LM but the show closed after just 233 performances and never recouped its costs. Also available to the sharp bidder is a 1946 album of the Broadway revival of “Show Boat.” Jerome Kern and Oscar Hammerstein II created the musical in 1927. It ran for nearly a year and a half to great critical and popular success. 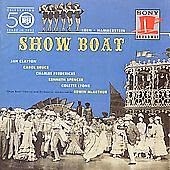 The album from the 1946 revival of "Show Boat." JK and OH II wrote the part of Joe, the stevedore, especially for Paul Robeson. The formidable actor would go on to sing “Old Man River” in the 1928 London stage premiere, as well as the Broadway revival in 1932 and the 1936 film. The 1946 revival was held at the Ziegfeld Theatre, which was the venue for the original Broadway production. The Addams Family was anything but a rousing success when it played on Broadway in 2010, though it is currently touring the world with companies across the United States, in Brazil and in Sydney. Krysta Rodriguez won acclaim as an exciting newcomer, portraying the original Wednesday Addams. Wednesday's red T-shirt, in small, can be picked up for a modest bid and appreciated by a troubled teen, perhaps your own. A caveat: keep in mind as you troll through the ebay theatrical memorabilia that some of these treasures may no longer be available.You may find others, though, adding to the thrill. 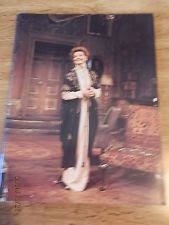 Elsewhere, the visit turned up a 1976 souvenir program of a rare Katharine Hepburn stage appearance in “A Matter of Gravity.” It was marked a mere $12. The play was popular despite poor reviews. Katharine Hepburn is the "girl" on the cover of the "A Matter of Gravity" program. “A Matter of Gravity” closed on Broadway after three month and embarked on a successful national tour. During the Los Angeles leg, KH fractured her hip. Ever the trooper, she chose to continue performing from a wheelchair. Visit http://www.ebay.com/bhp/broadway-shows and http://www.ebay.com/sch/Theater-Memorabilia-/2362/i.html to learn more about EBay theatrical memorabilia.